On March 7, 2012 Judge Mitting of the British High Court of Justice quashed the British General Medical Council (GMC)’s finding that Professor John Walker-Smith was guilty of serious professional misconduct. On November 21, 2014, for the umpteenth time, an anti-vaccine activist linked to the decision regarding Walker-Smith as evidence that Andrew Wakefield was wronged when the GMC found him, too, guilty of serious ethical violations. The problem is that that’s incorrect. While others have examined the issue, it might be worth examining the decision closely yet again, since several tropes that Andrew Wakefield was wronged continue to come back to life. Let’s start by examining the charges brought against Wakefield and Walker-Smith, using a side by side comparison of each charge. Requesting funding from the Legal Aid Board for things that were already covered by NHS (and therefore no funding was needed), used part of that money for other than the purpose it was granted. Subjecting some of the children to investigations for research purposes (rather than clinical purpose) without ethics committee approval. Based on letters, medical records & on what was done following the project 172-96. Children: 2, 1, 3, 6, 9, 5, 12, 8, 7, 10. For several of the children:a. Conducting clinical investigations for research purposes (rather than for clinical purposes) with no ethics committee approval. There was ethics committee approval for a specific project, with conditions, but the children in question did not meet the conditions.b. Subjecting several of the children to investigations contrary to their clinical interests.c. The panel rejects Wakefield’s claim that his role was purely administrative and finds him directly responsible. d. Not proved for most of the children (very few exceptions): not including the informed consent form – condition set after their investigation started. Subjecting the children to research investigations not covered by any other project except 172-96 – and not meeting the conditions of that project. Children 1, 5, 9 and 10 were referred for investigation of role MMR played in developmental disorders, with no gastrointestinal symptoms, in contrast to impression the paper, Wakefield’s testimony to Medical Research Council (March 23, 1998) and letter by Wakefield from 2 May 1998 gave of routine referrals to the gastroenterology department. And Wakefield knew this was inaccurate. Children 1, 5, 9 and 10 were referred for investigation of role MMR played in developmental disorders, with no gastrointestinals symptoms, in contrast to impression the paper gave of routine referrals to the gastroenterology department. This was irresponsible and misleading. Referrals of child 2, 9, 5, 12 included active referral by Wakefield, contrary to impression paper, statement and letter gave of routine referral. And Wakefield knew this was inaccurate. Referrals in the paper were not routine, contrary to impression in the paper (Walker-Smith made no follow up statements to that effect, it seems). Paper stated that investigations were approved by ethics committee when there was no such approval. Panel found not proved: intent to deceive on this. But found proved that this was irresponsible. Paper stated that investigations were approved by ethics committee when there was no such approval. Panel found not proved: intent to deceive on this. But found proved that this was irresponsible. Not disclosing in Lancet paper:a) Involvement in MMR related litigation. b) Getting funding from the Legal Aid Board. c) Involvement in filing a patent related to a measles vaccine and treatment of inflammatory bowel disease. Not an issue in this case. Giving a child transfer factor – part of the patent – without informing the child’s doctor, for experimental reasons, against the clinical interests of the child.Panel found not proved claims that this was without ethics committee approval or without obtaining information about safety of transfer factor in children. Giving a child Transfer Factor – for experimental reasons, without recording that in medical records or informing the child’s physician. Taking blood from children at a birthday party without ethics committee approval, in an inappropriate social setting, with callous disregard to pain and distress of children involved. Not an issue in this case. Note: both cases contained some charges found “not proved.” This was not a situation of automatic condemnation. This was a detailed discussion of specific claims. Even a cursory look at this list shows that while there is some overlap, the allegations against Andrew Wakefield were more extensive and more serious. In other words, he was charged with actions not imputed to Walker-Smith, and hence not addressed in the appeal by the latter. The most serious ones were probably not disclosing his litigation-related conflicts of interests. Those were actually addressed in Walker-Smith’s appeal – in ways that emphasize the problematic behavior of Andrew Wakefield. First, in relation to a costing proposal for a study Wakefield submitted to the Legal Aid Board, the decision said that “[t]he GMC did not suggest that Professor Walker-Smith knew of the existence of this document or proposal until 2004, at the earliest” (see paragraph 5 of the decision). Similarly, in paragraph 7 a letter by Walker-Smith to Wakefield described his discomfort with the involvement in litigation “pursuant to which the Legal Aid Board had provided £25,000 in December 1996 towards the costs of the “MMR investigation” (id). This, again, suggests Walker-Smith was not aware of Wakefield’s full involvement in the process. It went beyond this–though he clearly was aware that some of the parents whose children were brought to him were part of the litigation (and more on that later). In other words, the serious allegation of hiding conflicts of interests was only raised against Wakefield. Walker-Smith’s decision only addressed these to emphasize that Walker-Smith, too, was not aware of the full extent of Wakefield’s conflicts of interest. Let me start by saying that anti-vaccine activists are correct when they say in comment threads that the GMC did not find that Andrew Wakefield committed research fraud. The GMC did not consider that question–those were not the issues before it. The GMC’s decision focused on the treatment of children subjected to invasive procedures without ethics approval–the Lancet 12 and the children Wakefield took blood from in the party – and on misrepresentations related to conflicts of interests and ethics approval. Our knowledge of Wakefield’s problematic research practices comes from elsewhere: from the series of well-documented articles in BMJ by Brian Deer and Fiona Godlee and from Nicholas Chadwick’s, Wakefield’s research assistant, testimony before NVICP in the Autism Omnibus Cases (pdf). The GMC did bring two charges related to the presentation in the Lancet paper: that the paper stated there was an Ethics Committee approval when there wasn’t one; and that the paper – and Wakefield and Walker-Smith – represented the children’s referral as routine when they were not. One of the allegations raised against both Wakefield and Walker-Smith was that an inaccurate statement was included in the paper about ethics approval. In Judge Mitting’s decision, he overturned that finding against Walker-Smith. Does that decision also absolve Wakefield from the charge? No. In other words, if the panel believed Walker-Smith’s claims, his behavior was not misconduct, just misplaced trust: it was an error to trust Andrew Wakefield to properly change the misleading statement. The problem is that the panel did not make a clear finding on whether it believed Walker-Smith’s version. But the implication is clear–if the panel accepted this version, it would exonerate Walker-Smith from misconduct, but not Wakefield, who took on himself responsibility for accuracy and then published an untrue statement. Quite the converse: it presents Walker-Smith as a victim of Wakefield’s untrustworthiness. Both Walker-Smith and Wakefield were found guilty of misrepresenting the study population. Judge Mitting overturned this in the case of Walker-Smith–and this is one instance where I believe the judge’s conclusion was simply wrong. The GMC charge sheet found proved that this was misleading because it implied a routine referral for gastrointestinal problems. In contrast, referring doctors were referring the children to investigate a connection to MMR – and for several of the children for Wakefield, and for one only for Walker-Smith, there was active involvement in recruitment by the authors. I think the judge is wrong on this issue. The GMC finding focused, to my understanding, on the omission. By mentioning the children were consecutively referred and not explaining the context the paper hid an important source of bias. Especially since the paper did draw on parental observations as a data source. The oblique reference to a self-referred group does not make up for this omission–there could be any number of reasons for this self-referral. 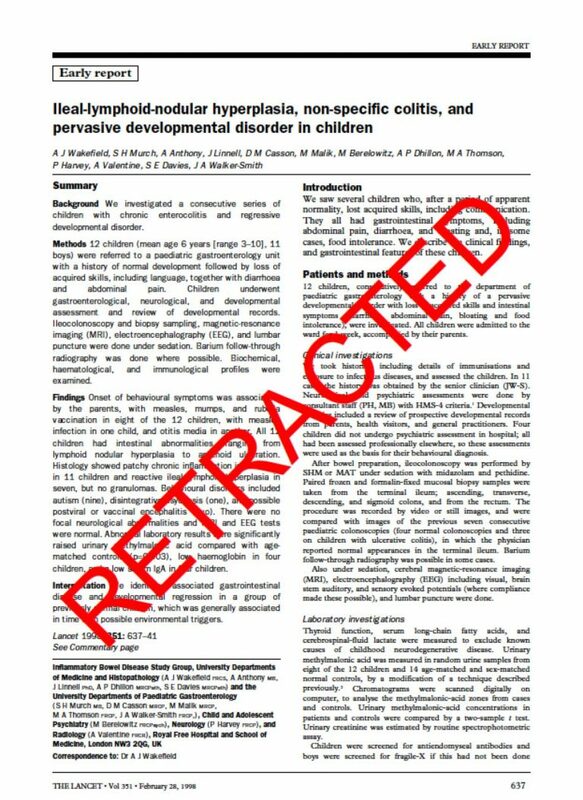 The paper as it was did not warn readers that the children investigated were from a group of parents that went in believing in a connection between MMR and their children’s neurological (and potential gastrointestinal) problems and had a direct interest, as plaintiffs, in proving a connection, a non-random group who was also in touch with, and informed by, similar guiding actors–and it used parental observations as at least part of is sources. The paragraph the Judge quoted, the one mentioning that the group was self-referred, then went on and emphasized the consistency of the finding across the children. But given the biased selection process, consistency is hardly surprising: these were children who all came from a group of parents with similar claims. The presentation masked that. In other words, the GMC was right that this presentation misrepresented the study population and hid from readers an important source of bias in the paper. Even more important, even if we accept the judge’s conclusion it does not overturn the finding in Wakefield’s case. That’s because the finding against Walker-Smith only relied on the wording in the Lancet paper. The finding against Wakefield relied on additional statements. These statements are very clear–Wakefield was claiming routine referral, and claiming the children were not a biased sample. These were not Walker-Smith’s statements and they apply to Wakefield alone – and they were untrue, since several of the children were from the litigation. Therefore, even if overturning the finding against Walker-Smith on this point was justified – and as I said, I don’t think it was – it would not overturn the finding that Wakefield misrepresented this issue. The one area of real overlap between the allegations against Wakefield and those against Walker-Smith is in relation to the tests which were described by Walker-Smith himself as high-risk (Mitting decision, paragraph 6), and which were performed on the 12 Lancet children. For both Wakefield and Walker-Smith the GMC found that they performed clinical investigations on children for research purposes without ethics committee approval, and for some of the children, the GMC found the investigations were contrary to their clinical interests. This is the longest part of both the GMC charge sheet and the opinion, going into detail about each child’s case. Research that required ethics committee approval or not? What did Judge Mitting say about this? The main disagreement, he correctly highlights, was between the GMC claiming Walker-Smith was doing research which required ethics committee approval and Walker-Smith claiming he was involved in medical practice. It should be highlighted that Brian Deer highlights the difference between Walker-Smith’s 2003 memoirs and 2012 memoirs on this point, suggesting that in the early stages Walker-Smith admitted this was research, and suggesting he changed his tune because of the GMC’s charges. Judge Mitting opened by discussing the distinction between research and medical practice. He highlighted that contrary to the GMC’s interpretation, the actor’s intent was relevant to the determination–though not the only part of it. At least two problems arose, in judge Mitting’s assessment, in relation to the panel’s decision about Walker-Smith–the panel did not decide whether Walker-Smith’s intent was research or clinical practice, and the panel did not rule on Walker-Smith’s honesty or otherwise. In other words, the panel failed to decide issues that were critical to a finding against Walker-Smith. In other words, the question that Judge Mitting concluded was not properly addressed for Walker-Smith was very clear in relation to Wakefield: he was doing research, and he needed ethics committee approval to do that. For Walker-Smith, said the Judge, it’s a lot less clear. In paragraph 19, the decision sets out the reasons supporting the view that Walker-Smith was doing research and the reasons against that view. The judge then points out the paucity of the panel’s explanation on that score. He points out that the panel needed to address the reasons for finding that it was research, and that especially since the panel’s finding seemed to be the result of erroneously thinking Walker-Smith’s intent is irrelevant and that they did not need to decide whether he lied, the decision simply cannot stand. Thus, the decision finds that the panel did not properly explain why they found that Walker-Smith did research rather than medical practice, and may have used the wrong standard to do so. The problem, and the reason for overturning the panel’s decision here, too, was incomplete explanation. Judge Mitting overturned the finding that for some of the children the tests were not clinically indicated. In some cases, he did it on the basis of evidence of gastrointestinal problems the children had beforehand and improvement following treatment that Walker-Smith provided. In others, he overturned the decision for lack of explanation. To a large extent, as explained by Mr. Brian Deer in the comments, what happened was a change in the law. In Southall v. General Medical Council,  2 FCR 77, the court decided that in complex cases, the GMC needs to give a more detailed explanation than just find things proved or not proved – especially in relation to determination of credibility. (paragraph 56-57). Since the case was decided after the hearings about facts but before sanctioning, the GMC was not aware of it when it made its finding about Walker-Smith – and they were bare bone, not up to the standard. This is a positive change, generally: defendants deserve to know why the GMC decided against them – but in this case, the timing meant that explanations were given that fit the old standard but could not stand under the new. The Judge made it clear in the first case, of child 2, highlighting that the medical records were “equivocal”, and that the panel needed to explain which oral evidence they accepted or rejected. In other words, given the conflicting evidence, the panel needed to explain which evidence it was basing its decision on – and why the rest of the evidence was rejected. That lack of explanation made the decision untenable. For some of the cases, Walker-Smith’s experts strongly supported the clinical need for the tests. That was true, for example, for Child 1, where Dr. Miller described colonoscopy as “absolutely necessary”. And I think Judge Mitting is completely right that without addressing that testimony, without explaining why they rejected it, the panel’s decision cannot stand: it may have had a reason to go the other way, but ignoring such unequivocal expert testimony was very problematic. In other cases, Miller’s testimony was much less strong. For several of the children, the evidence of gastrointestinal problems was weak. For those, Miller said either that he would not have undertaken a colonoscopy or that he was not sure he would – but that given Walker-Smith’s clinical experience, the decision to do so was reasonable. In other words, he was deferring to Walker-Smith’s views. This is much less strong evidence that the decision was clinically founded. It suggests a high level of deference towards Walker-Smith – deference the panel was not bound by. But here, too, the judge highlighted the lack of explanation: explain why you are rejecting Miller’s testimony on this. That said, it needs to be highlighted that for several of the children Judge Mitting found strong indications that the investigations were clinically indicated. For others, he suggested that the panel’s decision cannot stand because the panel did not explain why it was rejecting the opinion of Walker-Smith’s experts. The lack of explanation is a serious flaw in the decision. What does this mean? It means that there is reason to say that this part of the decision may affect Andrew Wakefield’s case, and makes it harder to support the finding in his case that the tests were not clinically indicated. It’s not that it’s clear the tests were clinically indicated for all children–but by not addressing all the evidence, the panel did not provide a strong enough reasoning for its case. It’s true that Andrew Wakefield did not appeal his case; however, if the decision against Walker-Smith on this point cannot stand, neither can it against Wakefield. Does Walker-Smith’s decision exonerate Andrew Wakefield? The decision, if read generously, can cast doubt on one set of findings against Wakefield–that he subjected some of the children to invasive tests that were not clinically indicated. It leaves untouched, however, the rest of the charges found proved against Wakefield, and in fact, reinforces several of the allegations–for example,that Wakefield conducted research without ethics committee approval, that Wakefield included misrepresentations in the paper, and that Wakefield did not disclose conflicts of interests. It’s anything but an exoneration, and the charges against Wakefield, as the GMC concluded, amount to serious ethical violations. Editor’s note: This article was originally published in December 2014. It has been revised and re-published in light of the current kerfuffle regarding the Tribeca Film Festival. The zombie trope that Andrew Wakefield was actually innocent has arisen again.